Removing the heaters was a task that I (Zac) had been dreading for weeks. For some reason, the size and complexity of this project loomed large. The list went on from there. I hated thinking about it. And finally when it came time to actually take the heaters out, I stalled. Finally, after a few more days of frustration, Tiffany and I just decided to go for it. We had done a lot of research and had a pretty general idea of how to proceed. We had watched some videos from other conversions discussing this topic, but most were very vague. Of particular note was one of Bob Dorris Jr‘s video showing his heater removal. That video gave us the courage to dive in and just get it done. Our first step was the electrical. I was intimidated by this because I know nothing about vehicular electrical systems. However, once I actually took the time to look at how it worked, it was easy. Fortunately in our bus all the wiring is connected with plastic plugs… so I unplugged them and traced them back to the bus’s rat’s nest of an electrical panel and removed the wiring altogether. After that, it was time to cut the hoses. The coolant hoses ran from our engine in the front of the bus, down the driver’s side 3/4 of the way down inside the cabin, into one heater, went underneath the bus across to the opposit side, and entered the 2nd heater from below. The hose then looped back on itself all the way back to the engine. For some strange reason, we thought garden sheers would be a good way to cleanly cut the hoses. I guess the thought was that we could make a clean cut very quickly and then direct the flow of coolant. This was not the case. After we ditched that idea, we used a knife to cut the hoses which still ended up being pretty messy. We cut the part of the hose connecting the two heaters first. We figured that by doing that we could go ahead and eliminate the coolant already inside the heaters and just let gravity do some of the work for us while they drained. After we made the cuts and directed most of the coolant into buckets on the ground, we went inside the bus and cut the hose right before it entered the first cooler in the cabin. That let us remove the heaters entirely, leaving two pieces of open ended hose remaining inside. From there, we made two cuts to the hoses just behind the driver’s seat. 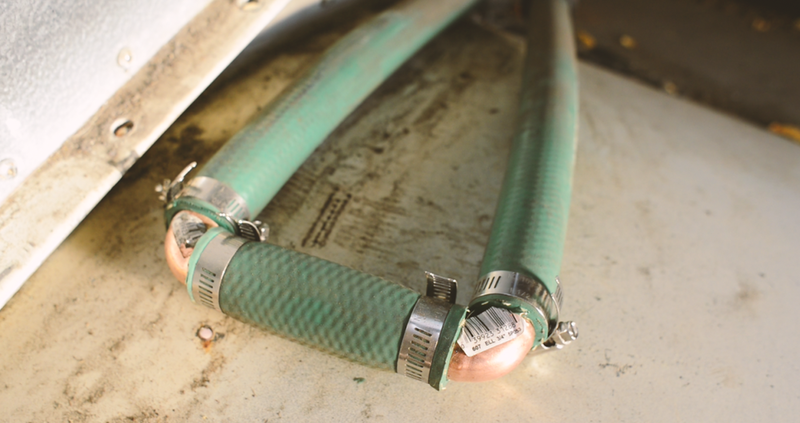 After a quick trip to Lowe’s where we picked up two 90º copper elbows and some fittings, we looped the hose back onto itself. (It was already doing this when the heaters were installed, we just removed the heaters from the equation). We tested he hose to make sure there weren’t any leaks by cranking the engine and letting it idle for a few minutes. With no signs of leakage, we took the bus out on a little test drive. No problems! The hose was warm which indicated that there was indeed coolant flowing through it, so we know for a fact its working. We may improve on the 90º elbows and fitting in the future, but for now they’re working fine. Job done. Due to our, ahem, unorthodox method of cutting the hoses, some had spilled onto the driveway. Coolant is extremely toxic to animals. Worse, it tastes sweet to them, so if they find some they drink it right up. We mixed dish detergent (degreaser) with water and poured it on the driveway. After letting it sit for a few minutes we scrubbed the area with a broom and washed it off. Once we finished cleaning the driveway we took our buckets full of coolant to an automotive store that disposes of hazardous liquids. It was such a relief to be done with this job. I had dreaded it for so long, but after it was over it felt like a weight had been lifted off my shoulders. And really, it wasn’t that bad. *It should also be noted that, unless you only spilled a very small amount, you should top off your coolant after everything is done. We’re planning on draining everything and replacing all our coolant in the near future.